Mostly sunny with light wind, low temp was -12 and a low of -5. It was -8 when I was Skiing. I was to the town office in morning to wish them a Happy New Year. In the afternoon I was skiing for 90 minutes and skied 5 km ( as indicated by the GPS unit). At 7:10 there was fire works in Victoria Park, we watched them from across the harbour in York Point. 10 km on EB in morning. And to all the readers of this blog, Happy New Year and all the best in 2010. Fresh snow on trees near the ball field. Cloudy with a few sunny breaks, strong wind most of the day. Low temp was -12, high -6. I was out on the skis for a hour, nice in the woods but the wind was raw when I was in the open fields. Temp at the time was -10. 10 km on EB in morning. Also used the snow blower to clear the drive again. Trail crossing a small stream. The ice was thick enough to hold me. Today was overcast in morning, started snowing late afternoon, about 5 cm but winds are presently 40 gusting to 60 km, so we have blowing snow. The day started at 2 but now -6. About 4 cm on snow last night so I used blower to clear driveway. I then was to Cornwall and later to Charlottetown. The fuel oil man was here today, 600 litres to fill the tank, last fill was November 4. I put 25 km on EB in two sessions. Overcast in morning, some sunny breaks in afternoon. Low temp of -1 and high of 7. Around home all day, 25 km on EB. I took a 30 minute walk in late afternoon logging 2,400 steps. Photos of tree with the sun shinning it, a couple of the early rising moon and clouds with the sun setting. overcast with a low of -2 and a high 1.5. 10 km EB in morning. I attended a Canata service in Hunter River in morning. This afternoon went for walk around the ball field and though the woods, I made 3,200 steps in 40 minutes. Photos are of the church and the Canata choir and stained glass windows. A mixture of sunny breaks and snow flurries with a low of -1 and a high of 3. 10 km on EB. I was to Charlottetown in morning and this afternoon I took a 30 minute walk though the woods near the ball field. I will be attending a Christmas eve church service at 9:00 PM. Photos are of trail in woods and the sun behind some clouds. Overcast with light rain, low temp 2.5, high 4.5 for the day. Over to the mall in the morning, around home for the rest of the day. I would say I am now ready for Christmas. Photos are of ball field, not much of our snow left. No skiing for a while. Overcast with light rain at times, low temp 2.5, high 4. 10 km on EB. I attended a board meeting morning, A Island trails meeting in Covehead in afternoon and cards at Warren Grove this evening. overcast with light drizzle and some fog at 3. 12 km on EB this morning. I was town the town office and to Charlottetown mall, lots of people at the mall. Over cast with a little snow, low temp -11, high 2. 15 km on EB. I was skiing this after noon for a hour, very nice as the temp was on the plus side. Photos are of a place in the snow where a bird of prey caught something in the snow, you can see where a wing brushed the snow. Because of the hole in snow my guess that it was a mouse that got caught. This Friday's post. Light snow at -13. I donated plasma in morning, went skiing for a hour in afternoon. At supper time my son arrived home for Christmas, a surprise as I wasn't expecting him until Tuesday. Cloudy with some sunny breaks, low temp was -14.5 and a high of -2. I was to Charlottetown in morning, I was skiing for a hour in afternoon, Temp was -13. This evening I attended a retired firefighters Christmas social. 11 km on EB. Photos taken while I was skiing. light snow all day, low for the day -10, high 1. Used the blower again today to clear the driveway. Attended a trails meeting this afternoon and a town council meeting this evening. Rain for most of the day, low temp was -6 with a high of 3. 10 km on EB. I was to Montague in afternoon to visit friends and went to cards in Warren Grove this evening. 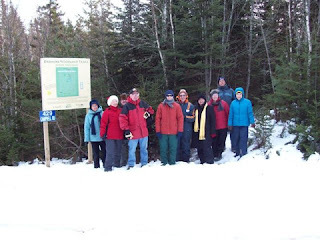 Photos are of the group that I was hiking with on Saturday. Snow overnight, some sun in afternoon, low was -5 and a high of 4. I used snow blower to clear the driveway. I went to the mall in morning and had a 30 minute walk in the woods by the ball field in the afternoon. Attended a committee meeting at town office in late afternoon. Sunny with light wind, low temp of -10 and a high of -2. I was to church in morning and in the afternoon took part in a "Journey to Bethlehem" by going three churches in Cornwall for a short service a one, then walk to the next one, another short service and then walk to the third one. Photos are of the three churches, Cornwall United, Cornwall Christian and St. Francis of Assisi. Cloudy with sunny breaks, still very windy, Low temp -9 with a high of -5. This morning I drove to Dromore near Mount Stewart and with ten other hikers I walked the Centre loop of the Dromoe trail. The loop is 4.2 km but with the connector trail I would guess about 5.5 km. This evening we were at a family Christmas dinner. Early this morning 14 km on EB. Photos are of the dirt road (Campbell road) to the trail head (seemed like 2 km). the sign at trail head and one of the bridges crossing the Pisquid river. Overcast and very windy, 40+ gusting to 75. Low temp of -6 and a high of 1. 10 km on EB. I was to town office in morning, I was to the APM center after lunch for the H1N1 flue shot. This evening I was to the Mayor's place for Christmas get together. Mostly cloudy with a few late day sunny breaks, the low was -2 with a high of 4.5. I spent most of the day putting lights on the Christmas tree and the outside decorations . I attended a committee meeting a the town office late in the day. 10 km on EB. Photos are of the outside decorations. Mostly overcast with light snow late in the evening, Low temp was -7, high was -1. I was to Charlottetown in morning. My sister and her husband visited in late morning. I watch some curling early in the afternoon and then was on skis for a hour. This evening attended a firefighters meeting. 12 km on EB. Photos are of hedge rows of trees planted a couple of years ago and evening clouds. Sunny with light wind, low temp of -9 and a high of -2. I spend some time in the shop in the morning. After lunch went sking for a hour (logged 2.9 km). I was to town office for a couple meetings and then the turning on the Christmas lights at the town hall at 6:30 PM. I was to Warren Grove to play cards in the evening. 10 km on EB. Photos are of the town hall after the lights were turned on, one taken with flash and the other without. Mostly sunny with light wind, low temp of -6 and the high was -2. I used the snow blower to finish clearing driveway this morning and was to Canadian Tire for a few minutes. This afternoon I was out on the skis for a hour, slow going, the snow had not covered all the weeds and grass yet. The GPS unit (Edith) showed that I travelled 1.4 km. Photos are snow blower, clouds to the south of ball field and the evening clouds as sun was setting, you can see the weeds in the field. Snow in morning and clearing late afternoon, by 8:00 stars were out. Low temp -3 and a high of 2.5. My guess is that we got 12-15 cm of snow. The Roar of the Rings curling has started so I will be watching a fair bit of it, In the afternoon game today Jones lost. Photos are of the snow on the trees. Overcast with light rain in evening, Low temp of -1 and a high of 6. Two sessions on EB for a total of 22 km. I was to the APM rink in Cornwall for a pancake breakfast in morning, later I spend some time in shop getting outside Christmas decorations ready to be put up. Tonight attended the firefighters Christmas dinner. Overcast all day with showers in morning. Low temp was 3 and a high of 11. 12 km on EB today, I donated plasma mid morning, it was a two arm donation as vein was missed in left arm, so then had use right arm. This afternoon I installed a new vent for the clothes dryer. After supper I was to the Charlottetown mall, a lot of people around. Photo is of the new office building on Fitzroy street, I think they must be near finished.